They say people find love in the most unexpected places. A train ride, a bar fight, in queue while buying groceries, or sometimes, even a chance introduction through a common friend. 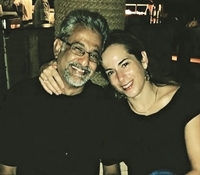 For Julie Lynn Tikekar and Maneesh Tikekar, it was the last. And since then, this couple have travelled from the UK to the US, Mexico, Germany and four years ago, India. a�?My husband is from Pune, so Ia��ve been to India a few times before his transfer brought us to Chennai,a�? begins Julie, a senior manager of risk management at PayPal. a�?I had also been backpacking in India a month before I met him,a�? laughs the avid traveller, who grew up in Michigan and studied languages in Belgium and France. Besides her love for travel, Julie also had a keen interest in working in the wine industry and that saw her take up jobs with the parent company of Jack Daniels and a wine maker in Germany, before doing her MBA. a�?That opened up a lot of opportunities, but I chose banking,a�? she laughs. Nevertheless, after a stint with Citi Bank in London, Julie switched to e-commerce and has never looked back. a�?Ecommerce is very market dependant,a�? she shares, adding, a�?There are a lot of country based challenges. For example, in Germany, the focus was on localising ecommerce.a�? After observing the ecommerce market in India for four years, Julie says, a�?In India, the learning curve is quite short because emerging markets already have exposure to the tech that markets like the US had to work on initially.a�? That said, she insists we have a long way to go. a�?Companies heavily rely on discounts to tap the market here. Other countries did this years ago and found that it was not the right motivation. As a result, logistics is still a big challenge here,a�? she points out. When not working, Julie makes time for her first love, travel. a�?Wea��ve been to Shimla, Kerala, Pondicherry, Kolkata a�� I wanted to see some of the designers there a�� and also made it to the Andamans,a�? she says. And given that her husbanda��s role with Ford is bound to keep them in the country for longer, Julie is working on a bucket list as well. a�?I want to do Gulmarg. That is definitely on the list. Also, me and my husband like skiing, and think that skiing in India would be really cool,a�? she concludes.